Gil Troy, an American who is professor of history at McGill University, is the editor, with Arthur Schlesinger Jr. and Fred Israel, of History of American Presidential Elections, 1789-2008, fourth edition. With Americans reeling from the “Joker’s” movie massacre in Colorado and the Sikh temple slaughter in Wisconsin, the disconnect between what they are thinking about and what their presidential candidates are talking about has grown. During this nasty nadir in the election cycle, the campaigns paused briefly as the nation grieved over the Colorado shootings. President Barack Obama visited Aurora and gave the nation the defining image of young Stephanie Davies pressing her fingers over her best friend Allie Young’s neck wound amid the gunfire, refusing Allie’s pleas to flee, saving Allie’s life. After the Wisconsin murders, Obama said he was “deeply saddened,” while Republican presidential candidate Mitt Romney joined in “mourning” the dead. But there was something missing in Obama’s and Romney’s remarks. Their words, while heartfelt, lacked the resonance of the greatest presidential responses to tragedy, which focused Americans on the particular loss, provided a renewed sense of purpose and blazed a trail toward transcendence from anguish. Lincoln and Roosevelt, among other presidential orators, understood they could not simply mourn. They had to motivate, they had to propel a huge, complicated and newly fragile country forward. Lincoln, at Gettysburg, spoke of “unfinished work” and “a new birth of freedom.” Roosevelt, who conjured the “warm courage of national unity” to fight the Great Depression, swore to avenge American deaths from Japanese treachery. A shooting at a mall and even a loner attacking a temple cannot be compared proportionately with wars, presidential assassinations, or mass terrorist attacks. Individual crimes, no matter how heinous, are not national assaults. And following the hasty attempt to politicize the shooting of Gabrielle Giffords in Tucson, Ariz., in 2011, when many reporters and Democrats wrongly blamed another crazed gunman’s sins on the red-blue political divide, politicians need to tread cautiously. But since the two shootings, millions of Americans have been going beyond the individual stories to ask broader, deeper, more disturbing questions. And instinctively, in this secular age of the media-magnified presidency, they look to America’s pastor-in-chief or pastor-in-chief-to-be to minister to their wounded souls and provide the kind of transforming sermon many of their parents and grandparents once received from preachers. Just as Obama, in 2008, used the Rev. Jeremiah Wright controversy to address the country’s tortured history of race relations, Americans need a candidate this year to address America’s values crisis. Americans need a leader to push the conversation beyond the left-right divide. Character questions should not be political but they can be shaped constructively by wise politicians. With Wall Street exposed and Joe Paterno deposed, with the economy flagging and political credibility sagging, Americans want a conversation about culture and belief and values that does not degenerate into debates about gay marriage or abortion rights. The common revulsion at the Colorado and Wisconsin crimes, along with many Americans’ growing fears that somehow these latest mass murderers from among us reflect something institutionally and ideologically broken, are building blocks for a national conversation. All Americans — all moderns — need “warm courage” to improve ourselves and our respective nations. Americans need a leader. And if done right, we will honour the victims. In running for re-election, Barack Obama commands the most powerful democratic platform in world history and the greatest backdrop, the White House. A seemingly casual announcement in a TV interview can trigger a political earthquake, as Obama did when he endorsed gay marriage. But the president’s magnificent residence can also be what Harry Truman called the Great White Jail. 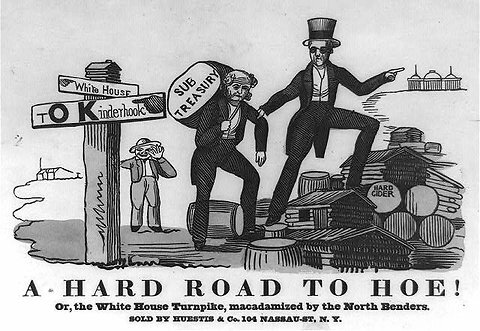 A cartoon depicted the obstacles facing President Martin Van Buren’s reelection effort in 1840. Weighed down by a bundle labeled “Sub Treasury,” Van Buren followed the lead of Andrew Jackson toward the White House. In 1864, Abraham Lincoln said he was too busy to campaign for reelection — a common presidential posture. Still, “Honest Abe” was a crafty pol, who was “too busy looking after the election to think of anything else,” according to his treasury secretary, William Pitt Fessenden. This posture of presidential passivity persisted, even after William Jennings Bryan’s 18,000 mile 1896 stumping tour ended the charade for challengers, who now campaigned openly and vigorously. The hyperkinetic President Theodore Roosevelt chafed under the restrictions in 1904, comparing it to “lying still under shell fire” when he was a Rough Rider. Still, T.R. understood that no matter what he did his election would be a “referendum on Roosevelt,” as one aide said. Unfortunately, F.D.R.’s act reinforced the traditional impression that politicking besmirched the president. Even while presiding over his party as adeptly as he presided over the nation, even while understanding how to sell policies not just develop them, Roosevelt disrespected the democratic dialogue. He treated the sacred act of soliciting voters’ support as a profane act of crass self-promotion. In 1964, Lyndon Johnson, despite being a Roosevelt protégé, could not keep up the charade of acting presidential for long. “Get in your cars and come to the speakin’,” he yelled as he motorcaded – and showered farm aid, disaster relief, food stamps and pay raises on the communities he visited. The Watergate revelations made all politicians look crooked. Nixon’s defense that every president acted ruthlessly resonated with the post-1960’s adversary culture epitomized by the hypercritical news media. Conflict-oriented stories emphasized politicians’ moral failings and the brutality of American politics. The Watergate debacle prompted a new presidential primness. Gerald Ford and Jimmy Carter each followed a “Rose Garden strategy” while running for re-election, obscuring their political calculations in moralistic claims that the nation needed them working in the White House. This return to a nineteenth-century delicacy culminated in Michael Dukakis’s 1988 campaign. Dismissed by one reporter as “just a brain in the jar,” the bloodless Massachusetts technocrat who was not even yet president was so busy declaiming what was and wasn’t “worthy of a presidential campaign,” he blew a 20-point summertime lead. Even before he became President, Barack Obama struggled with these mixed messages. In 2008, some aides welcomed stories that this high-minded philosopher-politician could be the tough Chicago pol when necessary. Now, Obama’s supporters are using the recent backlash against his Bain ads to emphasize that Obama “didn’t survive and triumph in battles with Chicago politicians, some of whom resembled dockside thugs, because he’s made of cotton candy,” as the Democratic consultant Donna Brazile wrote recently. Obama’s image is a hologram, sometimes hovering above the fray, sometimes plunging into the political muck. With his Dream Act-like executive order halting the deportation of illegal immigrants who came to the United States as children, Obama is campaigning by governing as F.D.R. did, approaching the shamelessness of L.B.J. and the desperation of Clinton, banking on Americans’ appetite for presidential remorselessness. No president can govern effectively without being a consummate politician, which includes knowing how to sell yourself, push your agenda, trim, spin, compromise, build coalitions, punish enemies and trash opposing ideas. While presidents also need to act proportionately and be statesmen-like, the presidential primness that began with George Washington was antidemocratic, reflecting the founders’ fears of mob rule. In our more democratic era, we still should fear demagogues while cherishing popular politics. The challenge is particularly difficult these days when politics seems so poisonous and presidents shrewdly seek insulation from the toxicity. Gil Troy, a professor of history at McGill University, is the editor, with Arthur Schlesinger Jr. and Fred Israel, of “History of American Presidential Elections, 1789-2008,” fourth edition. U.S. President Barack Obama is smart, eloquent and talented, but inexperienced as an executive. While he still needs more management experience, the presidency is not the right place for on-the-job training. The downgrading of America’s credit rating just days after the debt-ceiling fight ended – followed by wild stock market gyrations – risks branding Barack Obama’s presidency as a historic failure. The S & P analysts made it clear that they were passing political judgment on the United States, not just making an economic assessment. While Republicans clearly share the blame for U.S. political gridlock, Obama shoulders most of the burden as the person in charge. The perception of American paralysis reflects deep ideological divisions in the country as well as disturbing management failures in the Oval Office. Barack Obama is smart, eloquent and talented, but inexperienced as an executive. As a community organizer, an academic and a senator on the state and national levels, he has led but not managed. The presidency is an executive position and not a place for on-the-job training, especially during times of economic catastrophe. The debt-ceiling fight and the ensuing downgrade proved yet again that few politicians fear the current president. Obama seemingly skipped the section in Machiavelli that teaches “it is much safer to be feared than loved.” America’s president could learn from Canada’s current prime minister how to motivate in a muscular way, just as Stephen Harper could learn from Obama how to lighten a leader’s touch. Obama’s dainty presidency will continue drifting until both Democrats and Republicans, in Congress and in the executive branch, learn that crossing the president has a cost, and that this president, like other strong leaders, will wreak vengeance on errant allies as well as political enemies. Petulance is not enough. Obama has repeatedly denounced the Republicans as obstructionist. But these displays of presidential pique backfired, legitimizing Tea Party claims to being independent troublemakers. Moreover, Obama’s denunciations risk becoming ritualized, more like the fulminations of a substitute teacher who cannot control the class rather than the commands of the disciplinarian assistant principal who restores order. Obama has long struggled with this problem of presidential wimpiness. Rahm Emanuel swaggered into the Oval Office as White House chief of staff to be Obama’s enforcer. But years in the House leadership softened Emanuel, making him too deferential to Congress. Congressional Democrats acted with impunity during the two years they enjoyed a majority in both Houses. The result was the health-care bill, a bill so complex because it indulged so many legislative whims it is difficult for the president to explain clearly in popular terms. Obama’s most successful predecessors cultivated reputations for toughness. Theodore Roosevelt conceptualized the White House as a bully pulpit for national leadership while understanding the need to bully the occasional critic. Franklin Roosevelt’s famous challenge, “Judge me by the enemies I have made,” today sounds like a wartime boast. In fact, Roosevelt made this defiant statement during his 1932 campaign visit to Portland, Ore., vowing to confront greedy public utilities. As president, Roosevelt perfected various techniques for rewarding friends and punishing enemies. He distributed federal goodies like a tyrannical father doles out love, attention and allowance, favouring the districts of loyal legislators such as Congressman Lyndon B. Johnson, whose constituents then prospered. Conversely, while historians often emphasize Roosevelt’s failure to unseat the conservative Democratic congressmen he opposed in 1938, targeting some kept others in line. Ronald Reagan, like Obama, was constitutionally unable to bully party members who strayed or opponents who obstructed. But Reagan knew he had to telegraph toughness, especially because many underestimated him as a mere actor and a political amateur. In August 1981, when members of the Air Traffic Controllers’ Union went on strike, Reagan gave the controllers 48 hours to return to work. Two days later, he fired those who continued striking. Obama, like all effective leaders, must remain authentic. Seeking to play the role of the moderate is natural for him, and commendable. But many of America’s most successful presidents understood they had to be muscular moderates, building consensus without playing the patsy. Political scientist Richard Neustadt characterized the power of the presidency as the power to persuade. In fact, presidential power also comes from the ability to reward and punish, to create careers and destroy others – demanding a ruthlessness in domestic politics that Obama has rarely displayed. Leaders, even muscular moderates, should be feared, respected and, if possible, as a bonus, loved. Gil Troy teaches history at McGill University. Barack Obama turns fifty today, August 4th. Both he and his country appear battered these days, as Obama’s White House recuperates from the bruising debt ceiling showdown and the United States remains stuck combating two wars along with one long-lasting recession. But the progress Obama and America have made since 1961 is extraordinary—and should remind Obama, along with other doubters, that it is premature to count out America. The United States into which Barack Obama was born in 1961 was deeply segregated due to an endemic, seemingly unchangeable racism, and profoundly scared due to an implacable, seemingly indestructible foe, the Soviet Union. Just days before young Obama’s birth, on July 25, President John F. Kennedy addressed the nation about the growing showdown in Berlin, warning that the United States would go to war, even nuclear war if necessary, to stop the Soviets from overrunning West Berlin. Nine days after Obama’s birth, on August 13, the Soviets began building the Wall dividing Berlin which would symbolize the Cold War stalemate for the next three decades. Obama was also born into a world still shellshocked by World War II and the Holocaust—in Israel, Adolph Eichmann’s trial for crimes against humanity was winding down. Demographers count Obama as a Baby Boomer, part of the population explosion and surge in family building that began in 1946 when more than 16 million American GIs began demobilizing. And it is sobering to compare America’s family stability, traditional values, and communal interconnectedness in 1961 with today’s age of disposable relationships, indulgent impulses, and self-involvement. Still, Obama is not a classic Baby Boomer, like Bill and Hillary Clinton. He was too young to watch Howdy Doody as a child, too young to draft-dodge or fight in Vietnam, too young to march for civil rights, too young to lie about having been at Woodstock—in 1969 when he was nine. Instead Obama, and his wife Michelle, watched the Brady Bunch when they were kids—it was Michelle’s favorite show—and came of age politically during Ronald Reagan’s 1980s. Becoming an adult in the Reagan era—Reagan became president in 1981 when Obama was twenty—Obama learned from liberalism’s excesses in the 1960s. In his book Audacity of Hope, Obama shows a sensitivity to cultural forces that his politically-obsessed Baby Boomer elders lacked. He saw the failures of the Great Society, economically, politically, culturally. He learned the limits of liberalism and Big Government, discovering that politics cannot shape everything, that culture, tradition, patriotism, religion, community matter. Yet, as a product of the politically correct 1980s—and by the late 1980s Harvard Law School at the height of PC-mania—Obama absorbed a series of assumptions that continue to color his worldview. Domestically, the intense opposition to Ronald Reagan caricatured the Republican Party as the party of greed, corporate America as more irresponsible than innovative, and white male culture as bitter and bigoted. Regarding foreign policy, the fights against nuclear proliferation, South African apartheid, and Reagan’s policies in Central America, crystallized biases against American power and in favor of the Third World, even as Reagan’s military resurgence helped bankrupt the Soviet Union, leading to America’s victory in the once-seemingly unwinnable Cold War. This mishmash of impulses, recoiling from classic Sixties liberalism and the Reagan counter-revolution, explains some of the paradoxes and blindspots in Obama’s presidency so far. He can infuriate his liberal allies by accepting budget cuts, and by championing moderation, because he saw in 1980, 1984, and 1988 how addictions to liberal orthodoxy killed Democratic presidential prospects. But by blaming the financial crash on corporate greed and Republican deregulation, without acknowledging Democratic culpability in demanding easy access to mortgages, he could fill his team with Clinton-era retreads who helped trigger the crisis, and, when pressured, resorts to a politics of petulance and finger-pointing that belies his more moderate impulses. In dealing with the world, his PC-politics explain his apologias for America’s alleged sins, his unconscionable preference for an illusory engagement with Mahmound Ahmadinejad rather than bravely endorsing freedom when Iranian dissidents first rebelled, his instinctive sympathy for the Palestinians, his inexplicable dithering on the Syrian file, and his penchant for disappointing American allies. At the same time, he learned enough from Reagan’s assertiveness, and was traumatized enough a decade ago during September 11th, that he has given the kill order when confronting pirates at sea, intensified the technique of assassination by drone aircraft, reinforced America’s presence in Afghanistan, and hunted down Osama Bin Laden unapologetically. The poet T.S. Eliot called the years between fifty and seventy “the hardest” because “You are always being asked to do things, and yet you are not decrepit enough to turn them down.” For the next year and a half, and possibly for the next five and a half years, Barack Obama will be asked to do heroic things, daily, lacking the luxury of refusing most requests. When he started campaigning for the presidency, had he anticipated how devastated the U.S. economy would be, he would have shorted the market. Instead, he has had a much tougher slog in office than he ever anticipated. As he passes his personal milestone, and anticipates his re-election campaign, he should reflect on all the changes America has experienced in his brief lifetime. In particular, communism’s defeat, and racism’s retreat, along with the dazzling array of technological miracles Americans engineered, should remind him of America’s extraordinary adaptability, steering him toward a more Reaganite faith in the American people and American nationalism, and away from his current, Jimmy Carteresque doubts about Americans and their ability to continue to prosper and to lead the world. Mr. Troy is Professor of History at McGill University, and the author, most recently, of The Reagan Revolution: A Very Short Introduction, (OUP) and Leading from the Center: Why Moderates Make the Best Presidents. His other books include: Hillary Rodham Clinton: Polarizing First Lady and Morning in America: How Ronald Reagan Invented the 1980s. Do the Democrats have a double standard for Obama? So did the Republicans for George W. Bush—who tolerated much more idealistic national building and budget-busting spending than they would have from a Democrat. And so did the Democrats for Bill Clinton—who would have pilloried a Republican president for establishing the kind of sexist atmosphere Clinton created in his White House. This inconsistency is a fact of partisan life. As long as most partisans build their party-affiliations into an identity rather than simply a series of policy positions, they will view their leader’s compromises as statesmanlike, not hypocritical, given how confident they are in their opponents’ shortcomings. Still, the Democratic turnaround this time is particularly whiplash-inducing. At the heart of the Bushophobia that consumed many Democrats since 2003 lay their disgust for George W. Bush’s national security policies. Moreover, Barack Obama’s own political identity and great success in defeating Hillary Clinton stemmed from his opposition to the Iraq War—which raised expectations among at least some Democrats that he would be a pacifist, Nobel Peace Prize-winning president. President Obama’s behavior in prosecuting the war on terror suggests we should rethink our understanding of presidential performance. Most of us, historians, voters, and especially journalists, focus too much on the Three Ps of partisanship, personality, and promises. As a result, we expect a revolution when there is a party turnover in the White House, and a fresh, young politician calls for “Change We Can Believe In.” We forget the constitutional checks and balances which fragment power, making dramatic change more difficult in the American system. And we forget that the world looks very different when you sit in the Oval Office as opposed to when you dream about winning the keys to it. My uncle learned during half a century in the advertising business that, in America, “the one constant is change.” But as citizens and observers, we should spend more time examining the presidency through a lens emphasizing convergence not divergence among administrations. The many cosmetic changes sometimes mask the necessary—and unfortunate—continuities. In Ronald Reagan’s administration, David Stockman was the most famous cabinet member frustrated by this convergence. In Bill Clinton’s administration, Robert Reich played that role. And under George W. Bush, the mantle was seized by Donald Rumsfeld, who could not impose on the military the sweeping changes he championed. I confess, one of the best compliments I can give Barack Obama is that he responded to the challenges America faced, rather than sticking to the script he and his fans devised. His muscular approach to fighting the war on terror does partially vindicate George W. Bush. But, more importantly, Obama’s actions acknowledge the complicated challenges America faces abroad. When Obama has approached this tough situation ideologically rather than pragmatically—contemplating trying Khlalid Sheikh Mohammed in New York, or treating the Ford Hood terrorist as a mere criminal—he has stumbled. Obama’s use of unmanned drones to hunt down terrorists, his successful pursuit of Osama bin Laden, and his support for some of the aggressive Bush-era initiatives to eliminate domestic threats all reflect realistic judgment. That’s leadership. That’s good governance. Obama’s challenge, our psychologist friends would suggest, is to “own” this convergence with Bush-era policies, rather than deny it. By acknowledging the continuities, Obama can then also show how he has put his own, Democratic, civil libertarian, more engagement-oriented, stamp on the policy, thus offering what he believes to be a mature alternative to George Bush and John McCain—while still imposing a reality-check on the too-pacifist, pie-in-the-sky idealists in his own part. We cannot escape history: Too many Americans awoke on September 11, believing we were enjoying a holiday from history. Communism had collapsed. The Dow Jones was rising. Electronic gadgets were proliferating. Serious thinkers and superficial commentators were claiming that Americans transcended history—using “history” as a euphemism for troubles. Al Qaeda terrorism abruptly ended America’s post-Cold War idyll, highlighting even a super-power’s vulnerability in the modern world. But the post-9/11 assumptions that this mass trauma would make American society serious proved as false as the September 10 assumptions that peace and prosperity would last forever or that anyone could escape from the various forces large and small which accumulate and shape us—which we then call history. We can defeat terrorism: Even before September 11, but certainly after the World Trade Center towers collapsed, the conventional wisdom imputed far too much power to terrorists. These big bangs in New York and Washington, as well as the latest wave of Palestinian terror that had started a full year earlier in Israel, seemed to be harbingers of perpetual attacks. But two leaders who were not afraid to be hated, President George W. Bush and Prime Minister Ariel Sharon, showed that reacting to terrorist attacks was not enough. Pushing back militarily, hunting terrorists down, keeping them on the defensive, was the best way to prevent future attacks. Terrorists have trouble planning attacks on the run or under bombardment. Islamists—and eventually the Palestinians—also suffered from their own, often-overlooked, version of blowback. Suicide bombings of office buildings and cafes, buses and bar mitzvahs triggered mass revulsion. The terrorists lost what little romance they cultivated in the 1960s and 1970s, appearing to be barbarians who hurt their own cause. Ten years later, Al Qaeda has nothing to show for its spectacular mass slaughter in 2001; even Hamas is more likely to deny a terrorist attack than take “credit” for it. Islamism is evil: Prior to 9/11, the statement was doubly problematic. Many of our greatest thinkers recoiled from such judgmental proclamations, especially concerning any non-Western phenomena. The crime of 9/11 was so dastardly it shocked many—not all—back into a language of good and evil, right and wrong. And, as politically incorrect as it may be, many recognized that this fight was not just against a tactic—terrorism—but an ideology—Islamism. Islamism is a Jihadist, holy war-oriented, perversion of Islam, rooted in some Koranic teachings, but ignoring others. Despite their fury against Bin Laden’s brutal Islamism, few Americans attacked Arab-Americans or Muslim-Americans. George W. Bush deserves tremendous credit for repudiating such bigotry. American-Arabs and Muslims also helped themselves. Most are neither Islamists nor jihadists. The nineteen hijackers were foreign infiltrators not homegrown terrorists. And anyone who examined America’s Arab and Muslim population encountered law-abiding citizens, many of whom sought refuge in the United States from this fundamentalist fanaticism. Israel is not the problem: Bin Laden’s own words demonstrated his hatred for the West, and for America’s military presence in Saudi Arabia. He only redirected his Jihad toward Israel after 9/11, in a bid for popularity. As with this year’s Arab spring, the facts from the Middle East disturbed the conventional wisdom in the West. Nevertheless, so many supposed experts continued buying Palestinians’ propaganda line that solving their conflict is the keystone to world peace, when their future is not even the central regional challenge. Democracies are resilient: September 11 resulted from a dramatic American intelligence failure. Following September 11, Americans feared terrorism would triumph. President Bush made many, significant mistakes—or, as Republicans preferred to say it, mistakes were made. Yet, like Londoners in the 1940s, or Jerusalemites in the 2000s, Americans showed a grit and a grace, a unity and a sense of community, a softness in their hearts and a toughness in their spirits, that ultimately defeated the terrorists and healed the country, even as over 3000 families, friendship circles, neighborhoods, communities continue to cope with unfathomable losses. Presidencies often converge: For all their differences in tone, style, and ideology, Presidents Bush and Obama have responded in remarkably similar ways to their respective presidencies’ biggest crises. Bush looked downright Democratic in turning on the stimulus spigot to spend America out of its economic trauma. Obama has looked downright Republican in assassinating America’s enemies whenever and wherever he can. Perhaps, it is worth ratcheting down the rhetoric, just a bit, and understanding that responsible democratic leaders often have more limited options than it seems, and that responsible leaders often act responsibly, regardless of ideology. In the great American musical “South Pacific,” the main character asked a soldier, “We know what you are against, what are you for?” Bin Laden failed because he defined himself by what he opposed, while what he promoted was so chimerical, it made him look delusional and dastardly, addicted to death, with no plan for life. Gil Troy is Professor of History at McGill University. He is the author of “Leading from the Center: Why Moderates Make the Best Presidents” (Basic Books, 2008). 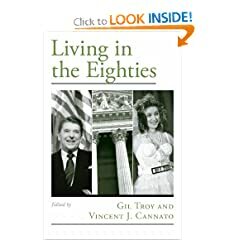 His latest book, co-edited with Vincent J. Cannato, is “Living in the Eighties” (Oxford University Press, 2009). The American voters gave President Barack Obama a good, old-fashioned political whupping on Tuesday. It was a stunning political reversal as Mr. Yes We Can became Mr. Why Can’t They Understand and Appreciate Me? President Barack Obama must learn his lesson from this political drubbing. To redeem his presidency, he must do what he originally promised to do, lead from the center—humbly and substantively. The rise of the Tea Party, the loss of many moderate Democrats in swing districts, and the reelections of many leading liberals, led some politicos to conclude that Americans do not want centrist leadership. This conclusion reinforces the Fox News-MSNBC view of the world as divided between good people – those who agree with me— and bad partisans—everybody else. Instead, the results reflect American structural anomalies, where moderates come from divided districts and extremists come from strongly partisan districts. During electoral tidal waves, the crucial swing voters veer left or right, wiping out moderates as extremists survive. Yet with the end of the 2010 midterms marking the start of the 2012 presidential campaign, Barack Obama should worry that independent voters abandoned him en masse. It is now clear that Obama erred by fighting for health care reform before lowering the unemployment rate. And it is now clear that having the health care reform pass by such a partisan, polarizing vote, undermined Obama’s entire presidential leadership project. The twentieth century’s two greatest pieces of social legislation—the 1935 Social Security Act and the 1964 Civil Rights Act—passed, after hard fights, with bipartisan support. That the twenty-first-century’s first great piece of social legislation passed without Republican support reflects Obama’s broader leadership failure. Obama 2.0. must resurrect one of the most powerful messages—and successful tactics—which propelled his meteoric rise to the presidency, his lyrical centrism. Barack Obama did not just promise “hope and change,” he promised a new kind of politics. In Audacity of Hope, Obama positioned himself as a post-partisan centrist who would resist Washington’s ways. Central to his appeal was his lyrical, multicultural nationalism, exemplified by his eloquent denunciation of the red-state-blue-state paradigm in his extraordinary keynote speech at the 2004 Democratic national convention. Americans did not just hire Obama to be president, they hired him to be that kind of a president, one who would reach out across the aisle, who would sing a song of national unity and purpose that was substantive, pragmatic, results-oriented, not just lofty and lovely. Unfortunately, as president, Obama has stilled his own voice, and failed to reconcile with Republicans. True, Republicans share responsibility for being truculent and obstructionist. But true centrism requires finding that golden path, that middle ground. Instead of delegating the highly partisan congress to craft the health care reform, instead of negotiating so desperately to forge his Democratic coalition, Obama needed to deliver bipartisan support for such a monumental shift in America’s status quo. The Social Security and Civil Rights bills quickly became part of the national consensus, thanks to the consensus-building presidential leadership which ensured bipartisan passage. By contrast, abortion has festered as an issue for decades because the Supreme Court legalized women’s right to choose, circumventing any kind of populist, consensus-building, democratic process. Having demonstrated great potential as a cultural leader in 2008, Obama should spearhead a fight against the gong-show-governance emanating from cable TV coverage of American politics. Watching MSNBC on Election Night, watching Keith Olbermann and company shout away at Congressman Eric Cantor—who enjoyed giving back as good as he got—I was struck by the cable echo chamber’s violent distortions. Politicians who spend their time appearing on these shows forget that only a small percentage of Americans are watching. The pols begin to think that everyone wants to play politics as a blood sport. Politicians should simply stop appearing on these shows until they foster civility. What a shame that we needed the comedian Jon Stewart to confront the Crossfire crowd in 2004. No politician had the guts to reject the format that fostered fighting, that rewarded unreason. Franklin Roosevelt called the presidency pre-eminently a place of moral leadership. Obama should take the lead with substantive moves to cut down the culture of confrontation. Obama also has to avoid presidential preening. Blaming his losses on miscommunication not substantive policy differences will lead him and his staff to focus on how things appear rather than what they should be. The elder statesman Dean Acheson once dismissed Richard Nixon by comparing him to a shortstop so concerned about how he looks when fielding, he misses the ball. Obama has always struggled with a grandiose and highly self-conscious side. Fighting for his political future, he needs to focus on substance, cultivating the big-tent governance he promised the American people. In the 1950s, Joseph Stalin dismissed Mao Zedong as a margarine communist. It was a delicious phrase, capturing the gruff former farm boy’s disgust for a product that looked like butter, but wasn’t. So far, Obama has been a margarine moderate, making superficial gestures toward dialogue and compromise, then sticking to one side of the aisle. Obama still has the time and the national good will to recover. Most Republican campaign commercials targeted Nancy Pelosi, or Harry Reid, or big government, not the president. This nuance reflected Obama’s personal popularity, despite his 55 percent negative job approval rating. Moreover, the economy could still revive, unemployment could fall, the Republicans could self-destruct by misreading this election as an invitation to showcase their extremists. Political greatness, in fact personal greatness, does not come from winning all the time, but from knowing how to turn devastating defeats into incredible opportunities. The true test of Barack Obama the man and the president has begun. Debate Shocker: Could it be that the candidates agree?